Students will be able to explain the effects of the Montgomery Bus Boycott. Have students turn and talk with a partner to share what they know about Rosa Parks. Have several students share what they discussed with the whole class. Ask students what they know about the Montgomery Bus Boycott. Most likely, students will know less about this than they knew about Rosa Parks. 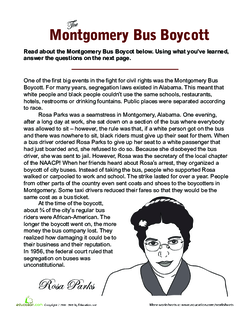 Tell students that they will be learning more about this boycott today and how it is related to Rosa Parks. Tell students that a BoycottIs the refusal to buy goods or services as a protest. Ask students how a boycott might effect a business in a negative way. Have some students share their thoughts with the class. Tell students that as they read The Montgomery Bus Boycott worksheet they will be thinking about Cause-effectRelationships. A cause-effect relationship is when one event causes another event to happen. 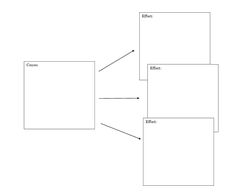 Draw a cause-effect graphic organizer on the board using the worksheet provided as a template, if needed. Fill in the "cause" box with the following sentence: "It was snowing a lot outside." Give students the following possible effects: "School was cancelled;" "There was a car accident;" "Some children went sledding." Draw three more cause-effect graphic organizers on the board. Fill in three more causes. Some ideas might be: "I left the window open during a thunderstorm;" "I forgot to do my homework last night;" "I did extra chores around my house." Have students generate at least one effect for each of these causes. When they have some examples, have them turn and talk with a partner or group and discuss some possible effects they came up with. Review the possible effects as a class. 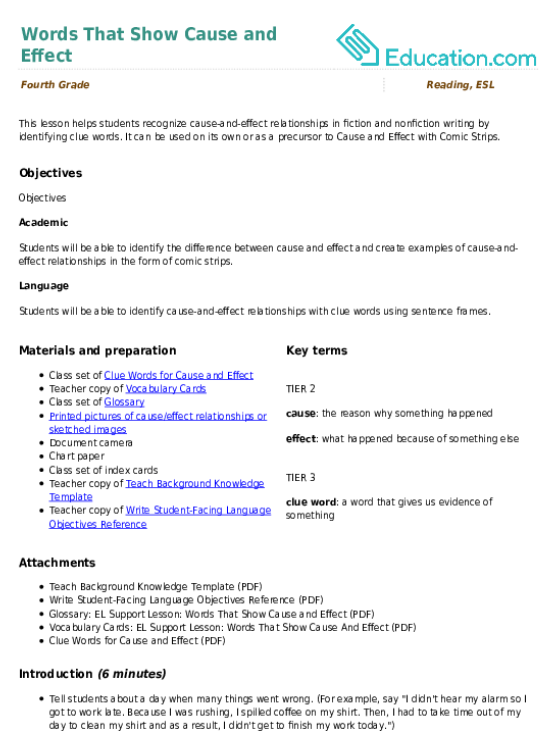 Hand out the The Montgomery Bus Boycott worksheet to students, as well as the Cause and Effect graphic organizer. Tell students that as they read, they need to find at least three effects of the Montgomery Bus Boycott and fill them in on their graphic organizer. Monitor students as they read and complete the graphic organizer to make sure they are on track. Enrichment:Students could research other historical boycotts. Have students answer the following questions about these boycotts: What were the effects? How do they compare to the effects of the Montgomery Bus Boycott? Support:Some students may benefit from reading the article with you, or with a small group of students. As they read, they should be prompted to look for effects and can highlight these effects as they come across them. Use the students' graphic organizers to determine whether or not they understood the effects of the boycott. A common misconception is to list a cause as an effect. For example, Rosa Parks refusing to give up her seat. Make note of which students have this misconception so you can address this in an individual or one-on-one setting. Have students share out the effects they found. Ask your students if they think a boycott is the most effective form of protest and why or why not. Have students share with a partner, and then share out with the whole class. Enhance students' knowledge of this important part of the Civil Rights movement while teaching cause and effect. 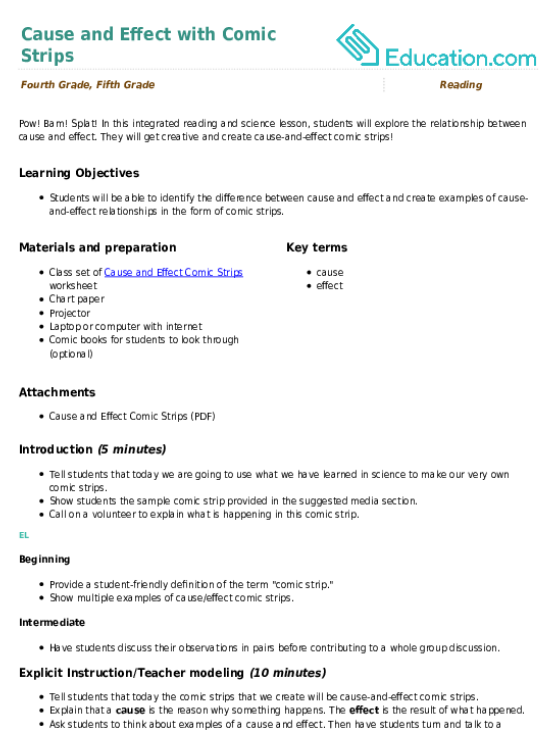 During this activity, students will create cause and effect comic strips complete with captions, pictures, and speech and sound effect bubbles. It can be used on its own or as a precursor to Cause and Effect with Comic Strips. Familiarize your students with clue words that help indicate cause and effect relationships. Use this glossary with the EL Support Lesson: Words That Show Cause and Effect. Use these vocabulary cards with the EL Support Lesson: Words That Show Cause and Effect. Build up your students’ reading comprehension as they learn about the various features of nonfiction text structure. Explore the role that symbols and codes have in helping us interact with one another. If it's about the art of communication you'll find it in here! 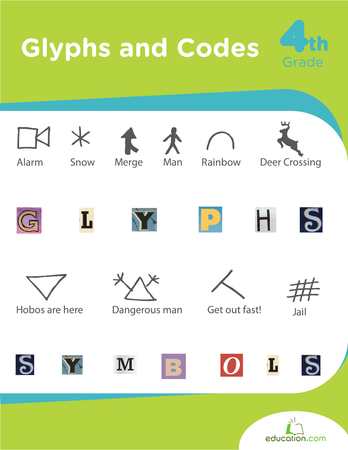 Use this glossary with the EL Support Lesson: Character Actions and Emotions. Use this glossary with the EL Support Lesson: Inferences and Introductory Phrases.